The Triple Helix innovation model focuses on university-industry-government relations. The Quadruple Helix embeds the Triple Helix by adding as a fourth helix the ‘media-based and culture-based public’ and ‘civil society’. The Quintuple Helix innovation model is even broader and more comprehensive by contextualizing the Quadruple Helix and by additionally adding the helix (and perspective) of the ‘natural environments of society’. The Triple Helix acknowledges explicitly the importance of higher education for innovation. However, in one line of interpretation it could be argued that the Triple Helix places the emphasis on knowledge production and innovation in the economy so it is compatible with the knowledge economy. The Quadruple Helix already encourages the perspective of the knowledge society, and of knowledge democracy for knowledge production and innovation. In a Quadruple Helix understanding, the sustainable development of a knowledge economy requires a coevolution with the knowledge society. The Quintuple Helix stresses the necessary socioecological transition of society and economy in the twenty-first century; therefore, the Quintuple Helix is ecologically sensitive. 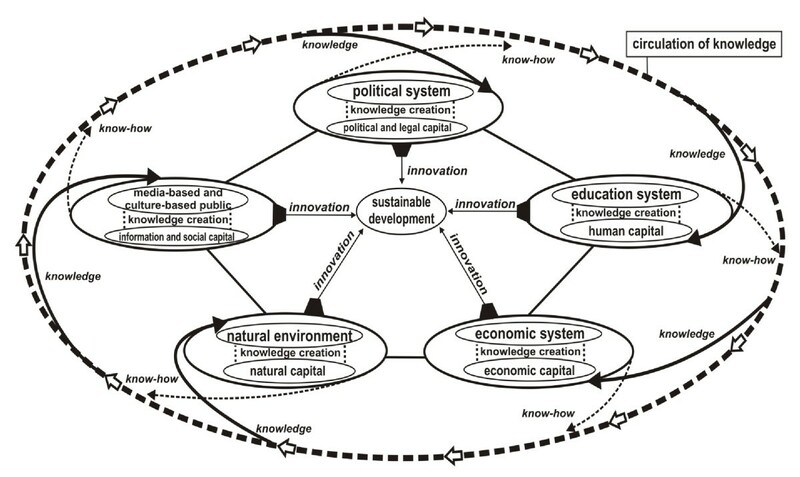 Within the framework of the Quintuple Helix innovation model, the natural environments of society and the economy also should be seen as drivers for knowledge production and innovation, therefore defining opportunities for the knowledge economy. The European Commission in 2009 identified the socioecological transition as a major challenge for the future roadmap of development. The Quintuple Helix supports here the formation of a win-win situation between ecology, knowledge and innovation, creating synergies between economy, society, and democracy. Global warming represents an area of ecological concern, to which the Quintuple Helix innovation model can be applied with greater potential. ‘Global warming’ represents an ecological (also socioecological) issue of importance and concern. Due to the escalation of global warming, it is time for humanity to think and act responsibly and determine sustainable solutions. Global warming, in addition to climate change, has caused the world to undertake new responsibilities (see IPPC [2007a]), which not only include further climate change, but in the long term, also hold humanity accountable in the prevention of new political and/or social conflicts, war on resources, new environmental catastrophes as well as serious crises in the market economies (see UNDP ; UNEP ). The special challenge of global warming can be tackled by ‘sustainable development’.a Sustainable development concerns us all and takes place on the local as well as global level. Hence, sustainable development has to be understood in the context of ‘gloCal knowledge economy and society’ (see Carayannis and Campbell ; Carayannis and von Zedtwitz ; Carayannis and Alexander ). Therefore, we must perceive global warming not as a challenge but rather as an opportunity to live innovatively and effectively in union with nature for a better tomorrow. To a large extent, humanity itself has caused the climate change; therefore, something must be done (see IPPC [2007b]; Le Monde diplomatique , pp. 72–73; Friedman ). However, there are hardly any comprehensive models or concepts to answer the ‘Why’ that truly shows ‘How’ we can act and learn accordingly or provide any demonstrative methods, suggestions, and examples how we can improve our actions in the present. Our analysis presented here suggests understanding the ‘why’ and consequently, offers a ‘model of innovation’ which demonstrates a feasible, step-by-step method to tackle the ‘how’. In the current academic debate, it is undisputed that a solution or a suitable answer regarding the challenge of global warming can only be found through utilizing the asset of human knowledge (see Carayannis and Campbell , p. 42; Bhaskar , p. 1). The key to success, as being determined by our propositions, lies in using the available and newly created ‘knowledge’ in correspondence with the Quintuple Helix Model (Carayannis and Campbell , p. 62). The Quintuple Helix is a model of innovation that can tackle existing challenges of global warming through the application of knowledge and know-how as it focuses on the social (societal) exchange and transfer of knowledge inside the subsystems of a specific state or nation-state (see Barth [2011a], pp. 5–7). The ‘nonlinear’ innovation model of the Quintuple Helix, which combines knowledge, know-how, and the natural-environment-system together into one ‘interdisciplinary’ and ‘transdisciplinary’ framework, can provide a step-by-step model to comprehend the quality-based management of effective development, recover a balance with nature, and allow future generations a life of plurality and diversity on earth (see Carayannis and Campbell , p. 42; Barth [2011a], p. 2). To sum up, our thesis is as follows: the Quintuple Helix represents a suitable model in theory and practice offered to society to understand the link between knowledge and innovation, in order to promote a lasting development. This contribution, under the aspect of global warming, focuses on the potential of a nation-state in the twenty-first century and on the following pivotal question: How can sustainable development, with regard to global warming, be practiced step-by-step with and within a Quintuple Helix model? The structure of our analysis is as follows. The Section ‘The challenge of global warming and the resource of knowledge’ is a short delineation about challenges of global warming and the organization of the resource of knowledge. In Section ‘What is a Quintuple Helix model?’, the Quintuple Helix model is defined. Next comes Section ‘The challenge of global warming in a Quintuple Helix Model’ that visualizes the Quintuple Helix model as a nonlinear model of innovation in correspondence with social (societal) subsystems and along with a descriptive step-by-step example of how the challenge of sustainable development (under the aspect of global warming) may be adopted. Section ‘Conclusions’ offers a conclusion in reference to the Quintuple Helix Model. 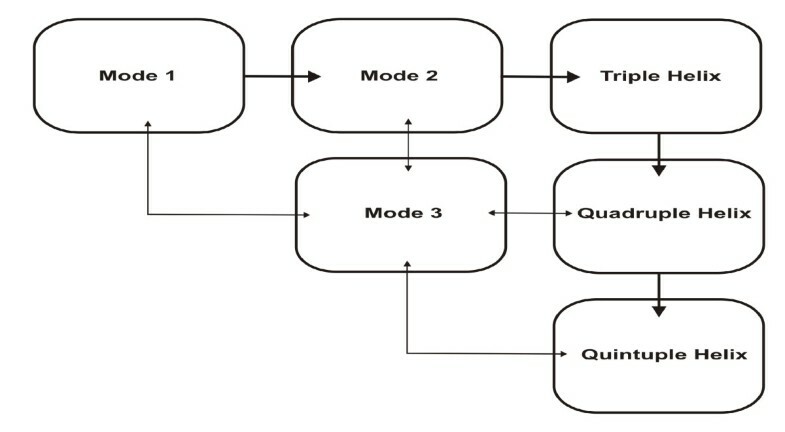 Mode 1 (Gibbons et al. ). Mode 1 ‘focuses on the traditional role of university research in an elderly “linear model of innovation” understanding’, and success in mode 1 ‘is defined as a quality or excellence that is approved by hierarchically established peers’ (Carayannis and Campbell , p. 48). Mode 2 (see Gibbons et al. ). Mode 2 can be characterized by the following five principles: (1) ‘knowledge produced in the context of application’; (2) ‘transdisciplinarity’; (3) ‘heterogeneity and organizational diversity’; (4) ‘social accountability and reflexivity’; (5) and ‘quality control’ (Gibbons et al. , pp. 3–4). Triple Helix (see Etzkowitz and Leydesdorff ). The ‘Triple Helix overlay provides a model at the level of social structure for the explanation of mode 2 as an historically emerging structure for the production of scientific knowledge, and its relation to Mode 1’, and it is a ‘model of “trilateral networks and hybrid organizations” of “university-industry-government relations”’ (Etzkowitz and Leydesdorff , pp. 118, 111–112). Mode 3 (see Carayannis and Campbell ). ‘The concept of mode 3 is more inclined to emphasize the coexistence and coevolution of different knowledge and innovation modes. Mode 3 even accentuates such pluralism and diversity of knowledge and innovation modes as being necessary for advancing societies and economies. This pluralism supports the processes of a mutual cross-learning from the different knowledge modes. Between mode 1 and mode 2 manifold creative arrangements and configurations are possible, linking together basic research and problem-solving’ (Carayannis and Campbell , p. 57). Mode 3 ‘encourages interdisciplinary thinking and transdisciplinary application of interdisciplinary knowledge’ as well as ‘allows and emphasizes the coexistence and coevolution of different knowledge and innovation paradigms’ (see Carayannis and Campbell , pp. 51–52). Quadruple Helix (see Carayannis and Campbell ). The Quadruple Helix model is based on the Triple Helix model and adds as fourth helix the ‘public’, more specifically being defined as the ‘media-based and culture-based public’ and civil society. This ‘fourth helix associates with “media”, “creative industries”, “culture”, “values”, “lifestyles”, “art”, and perhaps also the notion of the “creative class”’ (Carayannis and Campbell , pp. 218, 206). Quintuple Helix (see Carayannis and Campbell ). The Quintuple Helix model is based on the Triple Helix model and Quadruple Helix model and adds as fifth helix the ‘natural environment’. The Quintuple Helix is a ‘five-helix model’, ‘where the environment or the natural environments represent the fifth helix’ (Carayannis and Campbell , p. 61): ‘The Quintuple Helix can be proposed as a framework for transdisciplinary (and interdisciplinary) analysis of sustainable development and social ecology’ (Carayannis and Campbell , p. 62) (see also later our analysis in Section ‘What is a Quintuple Helix Model?’). The evolution of the models of knowledge creation. About these six briefly described models, it can be concluded that in a knowledge society (and knowledge democracy), at the national level, a network-style linkage of knowledge is being processed; each model fulfills a specific contribution for the ‘creation, diffusion, and use of knowledge’ (see Carayannis and Campbell [2006, 2010]). In reference to sustainable development, under the aspect of global warming, we should add whether in the future a state (nation-state) that is leading in world politics as well as in the world economy is also being determined by the social (societal) potential to balance new knowledge, know-how, and innovation with nature. The basic innovation ‘core model’ of the Triple Helix focuses on the knowledge economy. 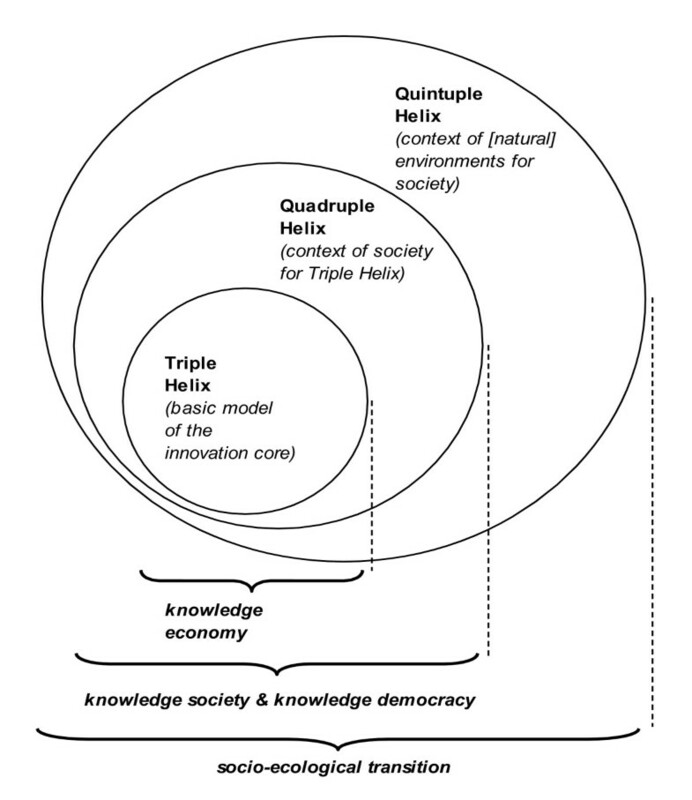 Quadruple Helix already brings in the perspective of the knowledge society (and of knowledge democracy). From the point-of-view of the Quadruple Helix innovation model, it is evident that there should be a coevolution of the knowledge economy and of knowledge society (see also Dubina et al. ). The Quintuple Helix finally stresses the socioecological perspective of the natural environments of society. Social ecology focuses on the interaction, codevelopment and coevolution of society, and nature (Carayannis and Campbell , p. 59). The ‘biophysical structures’ or ‘biophysical structures of society’ mark areas of an overlap between culture (the cultural) and nature (the natural). Furthermore, between these biophysical structures and nature, there operates a metabolism (a ‘social metabolism’, with the potential of a ‘sociometabolic transition’). Here, also specific ‘metabolic profiles’ apply (see Fischer-Kowalski ; Fischer-Kowalski and Hüttler ; Fischer-Kowalski and Haberl ; Haberl et al., pp. 201–202, 204; see also Hopwood et al. ; Kates et al. ). ‘Sociometabolic regimes represent dynamic equilibria of society-nature interactions and are characterized by typical patterns of material and energy flows (metabolic profiles)’ (Krausmann et al. , p. 1). The European Commission () identified the ‘socioecological transition’ as one of the major challenges for current and future societies and economies. The Quintuple Helix innovation model offers here an answer that is oriented toward problem-solving and sustainable development, furthermore, indicating how this socioecological transition may be mastered in combination with knowledge production and innovation (see Figure 2). In fact, this socioecological transition behaves also as a (social) driver for innovation, creating incentives for more knowledge and better innovation. Knowledge production and innovation. Knowledge production and innovation in the context of the knowledge economy, knowledge society (knowledge democracy), and the natural environments of society. Modified from Carayannis and Campbell (, p. 18), Etzkowitz and Leydesdorff (, p. 112) and Danilda et al. (). Hence, for more details, we look closer at the Quintuple Helix model in the following Section, ‘What is a Quintuple Helix Model?’. What is a Quintuple Helix Model? "‘The Quintuple Helix Model is interdisciplinary and transdisciplinary at the same time: the complexity of the five-helix structure implies that a full analytical understanding of all helices requires the continuous involvement of the whole disciplinary spectrum, ranging from the natural sciences (because of the natural environment) to the social sciences and humanities (because of society, democracy and the economy)’ (Carayannis and Campbell , p. 62)"
"‘How do knowledge, innovation and the environment (natural environment) relate to each other?’ (Carayannis and Campbell , p. 42)"
The analytical point of origin of the Quintuple Helix, as described in the Section ‘The challenge of global warming and the resource of knowledge’, is the Triple Helix Model of Etzkowitz and Leydesdorff () and is the Quadruple Helix Model of Carayannis and Campbell (). The social (societal) cooperation system defines itself based on the model of a Triple Helix, which consists of a combination of university (i.e., education system), industry (i.e., economic system), and government (i.e., political system) (see Etzkowitz and Leydesdorff , pp. 111–112). To this combination the authors (Etzkowitz and Leydesdorff) refer to it as ‘university-industry-government relations’, linking together the creation and exchange of knowledge between these three subsystems. Carayannis and Campbell acknowledged the nonlinear dynamics within the Triple Helix and extended this to the Quadruple Helix (see Carayannis and Campbell , p. 218): The Triple Helix is broadened within the Quadruple Helix through a media-based and culture-based public subsystem. The purpose of this extension is to include the public as well as the civil society as a fourth subsystem. The media-based public not only supports the diffusion of knowledge in a state (nation-state), but also the culture-based public with its values, experience, traditions, and visions, which promotes knowledge for the knowledge society (Carayannis and Campbell , pp. 217–227). Let us now have a closer look at the Quintuple Helix Model. In the year 2010, authors Carayannis and Campbell developed the Quadruple Helix further by adding a fifth helix to the modeling of knowledge and innovation, being the natural environment. The Quadruple Helix developed into the Quintuple Helix (see Figure 3) (Carayannis and Campbell , p. 62). The subsystems of the Quintuple Helix model. Modified from Etzkowitz and Leydesdorff (, p. 111) and Carayannis and Campbell (, p. 207; 2010, p. 62). "“The Quintuple Helix furthermore outlines what sustainable development might mean and imply for ‘eco-innovation’ and ‘eco-entrepreneurship’ in the current situation and for our future” (Carayannis and Campbell , pp. 62–63)." The education system: The education system, as the first subsystem, defines itself in reference to ‘academia’, ‘universities’, ‘higher education systems’, and schools. In this helix, the necessary ‘human capital’ (for example: students, teachers, scientists/researchers, academic entrepreneurs, etc.) of a state (nation-state) is being formed by diffusion and research of knowledge. The economic system: The economic system, as the second subsystem, consists of ‘industry/industries’, ‘firms’, services and banks. This helix concentrates and focuses the ‘economic capital’ (for example: entrepreneurship, machines, products, technology, money, etc.) of a state (nation-state). The natural environment: The natural environment as third subsystem is decisive for a sustainable development and provides people with a ‘natural capital’ (for example: resources, plants, variety of animals, etc.). The media-based and culture-based public: The fourth subsystem, media-based and culture-based public, integrates and combines two forms of ‘capital’. On the one hand, this helix has, through the culture-based public (for example: tradition, values, etc. ), a ‘social capital’. On the other hand, the helix of media-based public (for example: television, internet, newspapers, etc.) contains also ‘capital of information’ (for example: news, communication, social networks). The political system: The political system, as a fifth subsystem, is also of crucial importance, because it formulates the ‘will’, where to the state (nation-state) is heading toward in the present and future, thereby also defining, organizing as well as administering the general conditions of the state (nation-state). Therefore, this helix has a ‘political and legal capital’ (for example: ideas, laws, plans, politicians, etc.). The Quintuple Helix model and its function (functions). Modified from Etzkowitz and Leydesdorff (), on Carayannis and Campbell ([2006, 2009, 2010]), and on Barth ([2011a]). "“On the one hand, knowledge serves as an input or resource for advanced societies and economies, which increasingly depend on knowledge. On the other hand, knowledge production (knowledge creation) also generates knowledge as an output, which then is being fed back (recycled) as a knowledge input” (Carayannis and Campbell , p. 4)." Therefore, in a Quintuple Helix by and with means of the five helices, the exchange of knowledge in a state (nation-state) is being dealt with all its conjunctions, in order to promote knowledge-production-based sustainable development. Step 1: When more investments flow into the helix of the education system to promote sustainable development under the aspect of global warming, the Quintuple Helix Model shows and demonstrates that, as an input, investments create new impulses and suggestions for knowledge creation in the education system. For example, targeted investments produce new equipment, new places for scientists and teachers, and a higher research opportunity. Therefore, a larger output of innovations from science and research can be obtained. At the same time, teaching and training can improve their effectiveness. Particularly, the investment in education should have a positive impact on human capital as a manifestation of output of the education system; because of more resources, teaching and training should be more effective, allowing the human capital to realize chances and to target uses more directly. The output that arises from human capital for a greener development or sustainable development is, in turn, also an input in the helix of the economic system. "The economic capital of know-how is in this context sustainability. Here, the output of economic know-how will be a high-quality and sustainable economy, but in fact, the special know-how which the economic system implies now, is probably a new harmony of human beings with nature” (Barth [2011a], p. 8). Step 3: This new sustainability as an output of the economic system will be a new input of knowledge in the helix of natural environment. This new knowledge ‘communicates’ to nature that it will be increasingly protected, as lesser exploitation, destruction, contamination, and wastefulness (extravagance) is taking place. The natural environment can, thus, regenerate itself and strengthen its natural capital, and humanity can also learn again and further more from nature. (i.e., knowledge creation). The goal of this helix should be to live in balance with nature, to develop regenerative technologies and to use the available, finite resources sustainably and in a sensitive approach. Here, particularly natural science disciplines come into play, to form new green know-how for humans. This know-how as output of the subsystem of the natural environment can provide more environmental protection and a superior quality of life to people. Moreover, the development of new environmental-friendly technologies can reduce the CO2 emissions more effectively and can aid in diminishing climate change. In summary, the following can be explained in context with Barth about the helix of natural environment: ‘The output of the natural environment hence is a green know-how’ (Barth [2011a], p. 9). Step 4: The output of the natural environment is followed by an input of new knowledge about nature and a green (greener) lifestyle for the subsystem of media-based and culture-based public. In this helix it is of a crucial importance to communicate and to live a green lifestyle. Here, the media-based public receives a new and crucial function (i.e., information capital), which is spreading through the media the information about a new green consciousness and the new human lifestyle. This capital should provide incentives on how a green lifestyle can be implemented in a simple, affordable, and conscious way (i.e., knowledge creation). This knowledge creation promotes the necessary social capital of the culture-based public, on which a society depends for sustainable development. This social capital, therefore, must pass on information about wishes, needs, problems, or satisfaction of citizens as output into politics or the political system. The know-how output of the media-based and culture-based public serves thereby as new input for the helix of the political system. Step 5: The input of knowledge into the political system is the know-how from the media-based and culture-based public and represents also the collective knowledge from the three other subsystems of society. The important discussions on this new knowledge in the political systems are necessary impulses for knowledge creation. The goal of this knowledge creation is a ‘political and legal capital’, which makes the Quintuple Helix more effective, more high-quality, and more sustainable. Consequently, the newly obtained know-how is an output of suggestions, sustainable investments, and objectives. The new output of knowledge and know-how of the political system leads across the circulation of knowledge back again into the education system, economic system, natural environment, and media-based and culture-based public. Effects of investments in education for sustainability. In summary, as we illustrated by the example of the discussion in Section ‘The challenge of global warming in a Quintuple Helix Mode’ (‘five-step flow analysis’), it should be clear that all systems in a Quintuple Helix perform a pivotal function, influencing each other. If more sustainable development is being considered (and demanded) on a national level, as a result of global warming, and if, for instance, more targeted investments in a specific helix of the Quintuple Helix start flowing, then there will be a positive impact on all other subsystems and on the society as a whole. The Quintuple Helix Model demonstrates that an investment in knowledge and a promotion of knowledge-production brings into play new and crucial impulses for innovation, know-how and the advancement of society. By initiating small steps toward sustainability, long-term and leading knowledge societies can emerge, which will live in balance with nature and ultimately, perhaps, lead to a green economic wonder. To conclude, the Quintuple Helix Model makes it clear that the implementation of thought and action in sustainability will have a positive impact on the society as a whole. The new quality-management for more sustainability lies therefore in the creation of new knowledge, know-how, and innovation in balance with nature (see Carayannis and Campbell , pp. 58–62). One chief objective of the Quintuple Helix is to enhance value in society through the resource of knowledge. The discussion about the Quintuple Helix Model indicates that striving for the promotion of knowledge as a knowledge nugget should be regarded as being essential (see Carayannis and Formica , p. 152): This means that knowledge is the key to and for more sustainability and to a new quality of life. Today, knowledge is the most fundamental resource (Lundvall , p. 1). Nevertheless, whether a state (nation-state or beyond-nation-state) is leading in different fields in the future, will be primarily, if not even solely, be decided by its potential to develop new knowledge, know how and innovation in balance with nature. However, the improved exchange of knowledge and the striving for knowledge, new know-how, and innovations through the Quintuple Helix Model can be, or at least, offer a solution for the challenges of sustainable development under the aspect of global warming in the twenty-first century. Mastering and balancing ecological issues and challenges (such as global warming) are often being depicted and presented as a theme of survival for humanity in a global format. Consequently, the European Commission () can assert the major need for a greater socioecological transition. Social ecology makes the context of the natural environments for society and economy more visible and emphasizes an understanding of interaction and codevelopment of society and environment (nature). The Quintuple Helix innovation model (Carayannis and Campbell ) bridges social ecology with knowledge production and innovation. Here, the natural environments of society and economy not only challenge, but also encourage and inspire knowledge production and innovation. In the approach of the Quintuple Helix innovation model, the natural-environments-of-society are being identified as opportunities for driving further and excelling the sustainable development and coevolution of knowledge economy, knowledge society, and knowledge democracy. This also has a potential of influencing the way how we perceive and organize entrepreneurship. The article focuses on creatively designing and re-designing concepts on knowledge production and innovation. The points of departure are the Triple Helix, Quadruple Helix, and Quintuple Helix for innovation, and Mode 1, Mode 2, and Mode 3 for knowledge production. These concepts are all published and thus publicly accessible. The article engages in a detailed literature review on these concepts in their contextualization. The concept of the Quintuple Helix innovation system is being analytically applied to the ecological (socio-ecological) issue of global warming. aThe definition of the Brundtland Commission states that sustainable development ‘meets the needs of the present without compromising the ability of future generations to meet their own needs’ (United Nations [1987a, b]). bThe area of financial and economic system refers to financial and economic aspects of the effects of climate change. The following question arises (among other things): How should the two systems effectively change or adapt with-each-other in order to reduce or exclude crises in consequence of climate change (see for example: Barbier ; Barth [2011a]; Green New Deal Group ; Hufbauer et al. ; Meyer ; OECD ; Sen )? cThe area of environmental challenges has to do with causes and effects of climate change and which political and social measures should be taken to increase environmental conservation and sustainability (see, for example: IPPC [2007a, b]; Giddens ; Høyer [2010a]; Müller and Niebert ; Stern ). dThe area of feed and heal the world challenges emphasizes new and solution-oriented approaches under the aspect of knowledge and care in the course of climate change (see Parker ; Höll ). eThe area of energy challenges highlights new green technologies and renewable energy, which lead to sustainable development (see also Barbier ; Green New Deal Group ; Høyer [2010b]; UNEP ). fThe area of educational challenges is based on a better education as a key for empowerment, equality of chances and new knowledge for sustainability and development (see, for example, OECD ; O'Donnell ; Sen ; UNDP ). gThe area of political democratic reform across the world promotes democracy as being a local and global key for sustainable development. Here, also the themes of democratization, freedom, equality, policy-making, gender, and political culture are relevant (see, furthermore, Barth [2011b]; Biegelbauer [2007b]; Campbell ; Campbell and Schaller ; Kreisky and Löffler ; Otzelberger ; Ulram ). hThe area of transformative government across the world has to do with the political standing or rating of a nation-state. Examples here are the search for democracy, quality of democracy, types of political systems, etc. (see also Barth [2010, 2011a, b, c]; Campbell ; Campbell and Barth ; Campbell et al. ; Diamond and Morlino ; O'Donnell ; Rommetveit et al. ; Schumpeter ; Tilly ). iThe area of equity and security across the world refers to equity and security as being basic prerequisites to foster and support sustainable development (see, for example, UNDP ; Barth [2011a]). jThe area of technology, innovation and entrepreneurship as drivers of knowledge societies emphasizes the fact that a sustainable development in knowledge societies can only be achieved when new knowledge is promoted and produced and when innovations (with a new entrepreneurship) are developed further (see here the idea and concept of the ‘Academic Firm’, Campbell and Güttel ; see also and furthermore Bhaskar ; Biegelbauer [2007a]; Campbell ; Carayannis and Campbell [2006, 2009–2011]; Dubina ; Dubina et al. ; Kuhlmann ; Lundvall ; Nowotny et al.). EGC designed, innovated and provided the overall conceptual framework for analysis. TDB concentrated in detail on the literature review and its ramifications. DFJC focused on framing the concept of the Quintuple Helix innovation system in context of application to global warming. All authors engaged and cross-engaged in writing. All authors read and approved the final manuscript.